It’s Tuesday night and Hai Ngoc Lam’s neighbors are hungry. They start arriving at 5 p.m., walking the few blocks from their own homes or parking in the spaces Lam and his husband, Joe Acanfora, have left empty in front of their North Oakland duplex. One by one, they walk through the wire gate, up the front steps, and push open the front door that’s been left open—just a crack—for their arrival. Many have been repeating this Tuesday night ritual for years, but for any newcomers, an arrow on the door points up. Eating Saigon, it says, is upstairs. They come for the home cooked bún bò huế (beef noodle soup), bánh mì hấp (steamed baguette topped with meat and vegetables), phở gà (chicken noodle soup), or any number of other traditional specialties that Lam—a chef who immigrated from Vietnam in 2013 with his American husband—prepares each week. The neighbors have become friends over the years, but they’re also paying customers. Between 10 and 35 of them order on Lam’s website each week, pay using PayPal, and take food home either in their own Tupperware or the compostable takeaway containers that Lam and Acanfora provide. County health department officials across the Bay Area and California disagree with Lam’s sentiment, but state lawmakers are ready to allow cooks like Lam to continue selling meals prepared in their home kitchens. The Homemade Food Operations Act—AB 626—passed unanimously in the state senate and assembly this summer, and Governor Jerry Brown signed it into law on September 18, creating a pathway for counties to offer permits to home chefs. The law will take effect in January, but counties can still opt out by not creating local permits. In counties that allow them, home cooks could apply for a special microenterprise home kitchen permit, which would not carry the same restrictions on hand washing, sinks, ventilation, and animals that most other food facilities permits require. The permits would be limited to businesses with no more than one full-time employee and less than $50,000 in gross annual sales. Counties could place further restrictions on home cooking operations in regards to the types of food allowed and the days and times a kitchen can operate. The law will allow home cooks who are already making and selling food—like Lam and an estimated 50,000 other home cooks across the state—to legitimize their businesses and no longer risk criminal sanctions. Violating California retail food laws is a misdemeanor that can carry fines and up to six months in county jail. It will also allow home cooks to test early-stage food business ideas without needing to invest in a commercial kitchen. Building a commercial kitchen can cost hundreds of thousands of dollars. Renting one can get pricey too, especially in this low-margin industry: at Kitchener Oakland—one of the most affordable options and one designed specifically for microentrepreneurs—renting a shared kitchen space costs $23 an hour for 10 hours per month. Rates there go down with increased use; several similar kitchens operate in Oakland. Supporters say the new law will make it easier for the people who sell food from their homes (mostly women, immigrants, and people of color) to create or legitimize businesses as soon as permits become available in their counties. “In our view, this will become the new lowest-barrier-to-entry way to get your start in the food world,” said Matt Jorgensen, founder of the C.O.O.K. Alliance, an advocacy group for legalizing home-cooked food sales, and the leading voice pushing for the bill. Jorgensen was also co-founder of Josephine, an Oakland-based online meal sales app that connected home cooks with local customers before it was shut down in 2016 after a sting operation by Alameda County Environmental Health and Berkeley Public Health officials over concerns about food safety in unpermitted kitchens. The company continued operating in Portland and Seattle for a short time, but closed all operations earlier this year. State law currently requires that food for sale be prepared in a certified commercial kitchen that has been inspected and meets requirements for hand washing, storage temperatures, sinks, ventilation, waste water systems and more. Since 2012, exemptions have been made for “Cottage Food” operators—cooks in registered and permitted home kitchens preparing small amounts of packaged foods deemed low-risk for food-borne pathogens. The meals sold through the Josephine platform—by Lam and about 1,000 other California cooks—did not qualify for this exemption. Unlike other Josephine home cooks, Lam did not receive a cease and desist order during the sting, because he was on a long vacation at the time. When the couple returned, “our neighbors begged us to keep cooking for them,” Acanfora said. And since Lam loved cooking and the income he received from it, he decided to continue, despite the legal risk of doing so. The passage of the new law added to their confidence, and they agreed to share their story with Oakland North and The New York Times, which spoke with Lam and Acanfora on the same day. Since their business remains illegal until they become permitted, speaking publicly exposes their business to authorities. “Well, if they shut us down next week, we’ll take a vacation, wait for the new law to get implemented, and start again,” Acanfora said. But given previous opposition from Alameda County officials, it’s not clear if these permits will be available in Oakland any time soon. A representative from the board joined health officials from across the state to log their opposition to the bill at a June, 2018, meeting of the senate health committee, which ended up giving a thumbs up to the bill. County supervisors Wilma Chan and Keith Carson, who represent Oakland on the board, did not respond to a written request for comment by press time. Since the governor signed the bill, Alameda County Health Department leaders haven’t offered any clarity on whether they will endorse allowing home cooking permits in the county. Department spokesperson Sherri Willis said she had conveyed the question to Ron Browder, director of Alameda County Environmental Health, but had not received a specific answer. “Given the law isn’t effective until January 2019, it’s too early to comment,” she wrote, summarizing his response. Food safety is not the only concern of those who opposed the bill. Christina Oatfield, a former underground home cook and an attorney at Sustainable Economies Law Center (SELC), an Oakland-based legal research and advocacy organization that helped write the Cottage Food Act, believes that AB 626 creates a mechanism to exploit already-vulnerable entrepreneurs. The law includes provisions for third-party online companies to facilitate sales—companies like Airbnb, which provided funds to lobby for the bill so their hosts and others might be able to sell meals using the company’s “experiences” platform, and DishDivvy, a company based in Southern California that, like Josephine, connects eaters with home cooks via an app. But because her group supports creating economic opportunities for home cooks, they proposed amendments to the bill that would have made it more similar to California’s farmers’ market legislation. That legislation allows farmers to seek exemptions from the “standard size and pack” laws that make California fruits and vegetables commercially marketable and exportable. It also requires that the direct-to-consumer venues that sell this produce be run by nonprofits, government entities or farmers. The legislation, which passed in 1977, “prevents exploitive middle men from exploiting farmers,” Oatfield said. The proposed amendments were not adopted, and Oatfield said her group is now considering whether they could partner with another organization to create their own online sales platform to support food businesses in ways that align with their vision for worker justice. That said, it was in part the very forces Oatfield is concerned about that led his team to shutter Josephine. “We saw firsthand the pressure between investor expectations for growth and our desires to grow a values-based movement rooted in social justice,” he said. Now that AB 626 is law in California, he said the C.O.O.K. Alliance will promote similar legislation in other states and continue working locally to help home cooks get permits. Ultimately, they’d like to open a restaurant. “Open a restaurant in the USA! Yes, yes!” Lam said enthusiastically. He already owns a restaurant in Saigon, which is now run by one of his brothers. Lam hopes county officials will soon allow him to continue expanding the business that he loves. Saying yes to home cooks, he said, is an important step for helping people like him be successful. 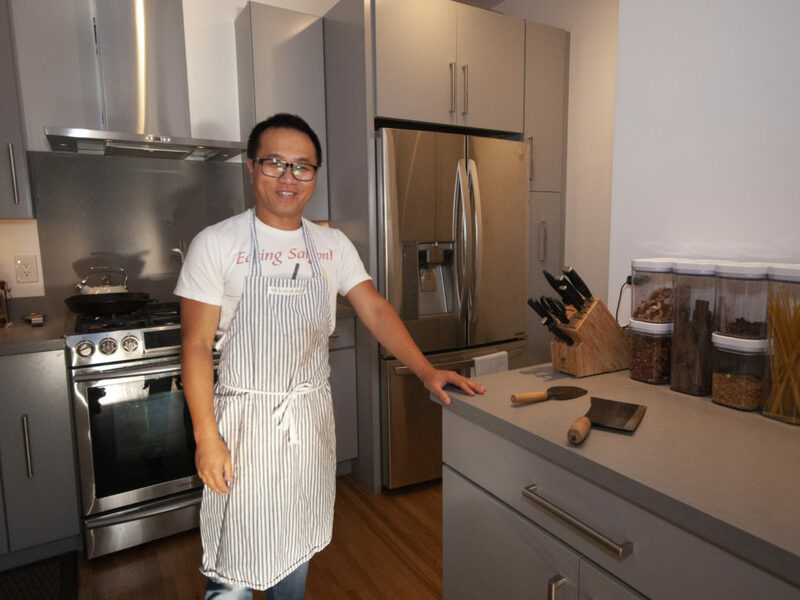 Hai Ngoc Lam, the home cook behind Eating Saigon, in his North Oakland kitchen. He sells meals prepared here to his neighbors every week.